After a brief hiatus I’m pleased to say the London Text Analytics meetup resumed last night with an excellent set of talks from the participants in the AnnoMarket project. For those of you unfamiliar, this project is concerned with creating a cloud-based, open market for text analytics applications: a kind of NLP ‘app store’, if you will. The caveat is that each app must be implemented as a GATE pipeline and conform to their packaging constraints, but as we’ve discussed before, GATE is a pretty flexible platform that integrates well with 3rd party applications and services. Here’s a quick shout out for Friday’s meeting of the London Text Analytics group, which will be held at Fizzback‘s offices on the Strand at 18:30. As usual, we’ll aim to start with a couple of informal talks then adjourn to a local pub for a drink or two afterwards. As it happens, this meetup is now full, but you can always join the waiting list or (if you’re not yet a member) sign up for early notification of the next event. Full details below – hope to see you there. Formalizing guideline text into a computable model, and linking clinical terms and recommendations in clinical guidelines to concepts in the electronic patient record (EHR) is difficult as, typically, both the guideline text and EHR content may be ambiguous, inconsistent and make use of implicit and background medical knowledge. How can lexical-based IE approaches help to automate this task? In this presentation, various design patterns are discussed and some tools presented. The availability and growth of the Linked Open Data cloud made exploiting the rich semantics easily accessible but also challenging mainly due to its scale. In this talk I will discuss challenges for building a Question-Answering system that uses these data as the main source for finding the answer. I will introduce the FREyA system which combines syntactic parsing with the semantic annotation in order to correctly interpret the question, and involves the user into dialog if necessary. Through the dialog, FREyA allows the user to validate or change the semantic meaning of each word in the question – the user’s input is used to train the system and improve its performance over time. Here’s something I’ve been meaning to share for a while. The content was written originally as notes to complement to my tutorial on NLP + IR, but I thought it might be informative to invite a wider audience. At some point I’ll update it to include a section on Sentiment Analysis (who doesn’t these days?!) In the meantime I hope you find it useful – feel free to suggest additions or improvements either here or offline. The field of text analytics is laden with jargon and acronyms, so before we go any further, let’s clarify a few terms. Text analytics describes a set of linguistic, analytical and predictive techniques by which structure and meaning can be automatically extracted from unstructured documents. Text analytics (TA) provides the ability to cluster, categorize and classify unstructured data, supporting both interactive exploration and automated document processing. TA processes can thus be used to improve the accuracy of search engines and to transform the search user experience by enhancing results presentation and facilitating interactive navigation and exploration. The term text mining has a history of at least a decade or more and is well understood by practitioner and research communities. The term text analytics has perhaps a slightly shorter history than text mining, but is growing rapidly in popularity as a label for the application of NLP techniques in practical, commercially-oriented contexts. Some authors treat TM and TA as synonyms, but this misses a subtle but important distinction: TM has its origins in automated, offline processing, characterised by ‘data in’ and ‘structure out’. It is primarily concerned with identifying and inferring aggregate patterns and insights across collections of documents. By contrast, TA is a more generic term, often associated with interactive, analytic applications and a focus on the analysis of individual documents. On the surface, the problem that TA attempts to solve appears trivial. After all, as humans we effortlessly create and interpret both spoken and written language, and rarely have to apply conscious thought to the process. But that, in many ways, is part of the problem: if the history of artificial intelligence teaches us anything it is that so many of the faculties that we possess as humans are not open to introspection and are therefore notoriously difficult to analyse and encode algorithmically. But that isn’t to suggest that the task is any less challenging: far from it. Natural language is littered with ambiguity, and it is only because we have evolved highly parallelised linguistic processes that work across multiple levels that we can make any sense of it at all. Although humorous, they illustrate much of the ambiguity in natural language, and just how much pragmatic and linguistic knowledge must be employed by NLP tools to function accurately. Various types of corporate document, etc. Moreover, the rate at which the world’s digital data repositories are growing creates a further challenge: according to International Data Corporation, the world generated 161 billion gigabytes of digital information in 2006 and is expected to grow to approximately 988 exabytes by 2010 (Ingersoll & Morton, 2009). And even if much of this date is in the form of audio, video, images, and so on, our current approaches to making this data searchable still revolve around the provision of manual summaries, captions and keyword tags. So in other words, we are producing yet more text that has to be analysed and managed. In addition to the growth of social media, we are seeing progressively more eCommerce sites employing user-generated content in the form of product reviews and opinions to support the purchasing process and drive sales growth. To maximise the value of this content, these organisations also need to employ analytic tools to make it searchable and navigable. In the section above we alluded to the highly parallelised nature of human language processing, and the notion that language understanding requires the application of linguistic and pragmatic knowledge across a number of levels. Text analytics is no different – all but the most trivial of systems will apply linguistic analysis across a number of levels, often in cascaded fashion, where the output of the simple, lower level processes feeds into more complex, higher level ones. In this section we will review the main techniques involved. At the most basic level is treatment of character encodings, such as ASCII, UNICODE, UTF-8 and so on. Although not traditionally considered an active area for NLP research, these processes nonetheless have a direct influence on the representation of case (upper & lower), punctuation, accents, and so on, which all in turn carry meaning at the lexical level (see below). At the level above characters we deal with terms and their variants, i.e. words, abbreviations, acronyms, compounds and so on. At this level, known as lexical analysis, we deal with tokenisation, i.e. the recognition of word boundaries. This process is relatively straightforward for languages that use whitespace as a delimiter, such as English, but is harder for languages such as Chinese and Japanese. At the lexical level we also deal with morphology, i.e. the process by which words are formed. Morphological analysis allows us to identify inflectional variants, such as “run” and “ran”, which are the present and past tenses of a common stem. In addition, we can also apply derivational morphology to recognise that “runner” is a further variant of “run” and “ran”, albeit in a different syntactic category (i.e. a noun in this case). Note that it is possible to write a reasonably accurate automatic stemmer for English, which will conflate sets of related terms to a common root. A popular example of one such tool is the Porter stemmer. Part of speech tagging has been researched since the 1950s (Voutilainen 2003) and a number of tagging systems are now easily available. These systems use a number of different strategies, including handwritten rules (Karlsson 1990), hidden Markov models (Cutting et al. 1992) and n-grams learned from text annotated with part of speech information (Church 1998). Phrase detection, i.e. recognition of noun phrases and other syntactic compounds. Parsing, i.e. the analysis of a sequence of tokens to determine their syntactic structure with respect to a particular grammar. In practice this often means analysing PoS tagged text to identify Subject—Verb-Object and other relationships to produce higher level linguistic analyses of in the text. The accurate identification of such entities confers a number of benefits. Firstly, by identifying such concepts in a document, it is possible to index documents at a more fine-grained level, which in turn allows more precise searching. The word ‘Bush’, for example, can refer to either a plant or an ex-President of the USA. By differentiating between words such as these (known as homonyms) we can maximize retrieval precision, i.e. the likelihood that information seekers will receive only those documents that are relevant to their query. Secondly, by identifying names within a document we can provide links to other related resources. Several content providers already use this technique to highlight the names of the key people mentioned in a news story, and provide links to their biographies. Similarly, it is possible to create more precise filters based on those named entities, allowing personalised delivery of content to individual users. For example, a news service might supply details of upcoming events in ‘New York’ as opposed to ‘new’ events in the city of ‘York’. post-processing transformations, such as machine translation (e.g. translating documents from one natural language to another) or text-to-speech output (e.g. providing spoken versions of stock quotes for access by phone). Information Extraction is the process by which structured information is automatically extracted from unstructured documents. Examples of the types of information which might be extracted include the movements of company executives, victims of terrorist attacks, information about mergers and acquisitions and interactions between genes and proteins in scientific articles. When the relevant information has been identified it is then stored in a highly structured format known as a template. PER NAME: "John J. Dooner Jr."
PER ALIAS: "John Dooner" "Dooner"
These template structures contain a large amount of information that enables complex queries to be carried out against the extracted data. For example, a user could ask for a list of all the events where a finance officer left a company to take up the position of CEO in another company. Once the templates have been extracted for a set of documents they can be used to populate a knowledge base derived from the corpus, or used as document metadata to improve retrieval precision. The name of the organisation and fact that two executives are leaving are contained in the first sentence. The names of the two particular executives and their posts are listed in the second sentence but it does not mention the fact that the executives are leaving these posts. Therefore, the succession event can only be fully understood through a combination of the information contained in both sentences. Combining such information across sentences is non-trivial since it is necessary to identify the phrases which refer to the common entities, i.e. ‘two top executives’ and ‘the executives’ in the above example. The process by which references between instances of one expression and another is known as anaphora resolution. A further challenge is recognising instances when a given entity may be referred to by different surface forms. For example, ‘International Business Machines Ltd’ may be referred to by an abbreviation (IBM), a nickname (‘Big Blue’) or a contextual anaphoric expression such as ‘it’ or ‘the company’. Challenges such as this are the main reasons it has proved difficult to create reliable information extraction systems. Scores for the template filling task in the MUC evaluations were generally in the 50–60% F-measure range, which at the time was insufficient for most commercial applications. An intermediate process which is somewhere between named entity extraction and full template filling is relation extraction. This task is simpler than full template filling since: (a) it aims to identify only relations between named entities (which are considered to be binary); and (b) only relations which occur within a single sentence are considered. These simplifications have meant that the task is more achievable than full template filling. In this section, we review some of the challenges presented by the polysemy: the phenomenon whereby a given term may have different meanings or senses. For example, the word ‘bat’ can mean ‘sports equipment’ (as in ‘cricket bat’) or ‘nocturnal mammal’ (as in ‘fruit bat’), etc. Consequently, if we are provided with no additional information, it is impossible to tell whether a query which contains the word ‘bat’ refers to the domain of sports or animals. This phenomenon is common to many natural languages and represents a significant challenge to retrieval precision. The process by which the meanings of a given word is identified is known as word sense disambiguation (WSD). One of the main determinants of word sense is syntactic role, i.e. words can have different meanings according to their use as a noun, verb, adjective etc. For example, two of the possible meanings of ‘light’ are ‘not heavy’ (as in ‘Magnesium is a light metal’) and ‘illumination’ (as in ‘The light in the kitchen is quite dim’). The first sense only applied when ‘light’ is used as an adjective, and the second only when used as a noun. Consequently, accurate identification of a word’s part of speech can be a valuable determinant of its meaning. Wilks and Stevenson (1998) showed that word sense ambiguity could be carried out effectively using a part of speech tagger when only broad differences between different word meanings were being considered. For example, this technique could be used to differentiate between the verb sense of “bank” (as in ‘the plane banked sharply’) and the noun sense (as in ‘financial institution’), but couldn’t distinguish between more closely related meanings such as the various noun senses used in ‘a car crashed into the bank’ or ‘the bank gave me a good rate on my mortgage’. There has been a long history of research into WSD in NLP during which a wide variety of techniques were investigated. Early approaches such as Wilks (1975) and Hirst (1987) applied techniques from artificial intelligence that relied on hand-crafted knowledge sources containing detailed semantic information. However, these approaches were limited by the fact that the information they relied on had to be manually created. Large-scale machine- readable lexical resources, such as WordNet, started to become available in the 1980s and were quickly used for WSD. They have the advantage of providing both a list of possible senses for each word and information which can be used to identify the correct sense, such as the hypernym hierarchy in WordNet. There has been some disagreement about the usefulness of WSD for IR. Some have argued that the benefits which might be gained from disambiguation are limited. Krovetz and Croft (1992; see also Krovetz 1997) manually disambiguated a standard test corpus and found that a perfect WSD engine would improve retrieval performance by only 2%. Sanderson (1994) performed similar experiments in which ambiguity was artificially introduced to a test collection by automatically creating ‘pseudowords’. He found that a 20–30% error rate in disambiguation led to text retrieval which was at the same level, or possibly worse, than if the ambiguity was left unresolved. Sanderson also found that queries containing fewer than five terms were less sensitive to mistakes in the disambiguation. He concluded that WSD was only useful if it was very accurate or the queries were short. Others have demonstrated that WSD can be used to improve IR performance. Schutze and Pedersen (1995) showed that disambiguation can substantially improve text retrieval performance; demonstrating an improvement between 7 and 14% on average. Jing and Tzoukermann (1999) have also reported improvements of 8.6% in retrieval performance. Their disambiguation algorithm computes the word sense similarity in the local context of the query, the similarity of the lexical-occurrence information in the corpus, and the morphological relations between words. In the traditional standard information retrieval paradigm, the user is provided with a ranked list of documents through which they must search in order to locate the information they are seeking. An alternative approach to meeting the user’s information need in a more focused way is to provide specific answers to specific questions. Question answering research has a long history (Green et al. 1961; Woods 1973) and was introduced as a task in the Text Retrieval Conference (TREC) IR evaluations in 1999 (Voorhees 1999). Within the TREC framework question answering can be thought of as a specialisation of the standard document retrieval problem in which the queries are expressed as natural language questions and the system is expected to identify the portion of the document in which the answer can be found. Like document retrieval, question answering is often carried out against a well-defined collection of documents which may, or may not, meet the user’s information need. The aim of the first stage is to predict the type of answer expected (for example, the expected answer for ‘When was Mozart born?’ is a date) and create a query which can then be passed to an IR system. Since the questions are expressed in natural language it is not surprising that text analysis techniques have been found helpful for this stage. For example, Greenwood et al. (2002) parse the question to produce a logical representation from which the expected answer type can be extracted. The problem of generating a query from the question has not exploited TA techniques to the same extent although some approaches, for example synonym expansion (Harabagiu et al. 2000; Hovy et al. 2000), have been explored. The second stage of processing passes the query to an IR engine with the aim of retrieving documents which contain the answer to the question. The final stage of processing, answer extraction, aims to extract the answer(s) from these documents, using the expected answer type information determined in the first stage. Various approaches have been applied to this problem and make use of a variety of TA techniques. Straightforward methods include simple regular expressions which match the text (Ravichandran and Hovy 2002; Soubbotin and Soubbotin 2001). More complex methods make use of deep linguistic processing. For example, Harabagiu et al. (2001) and Scott and Gaizauskas (2000) carry out detailed syntactic and semantic analysis of the retrieved documents which is then queried to identify specific answers to the question. Named entity recognition is often used to identify the items in the text which are of the same type as the expected answer and are therefore possible answers to the question. The nature of the question answering task, which includes the interpretation of natural language questions and identification of specific concepts and structures within documents, makes the standard document retrieval approach inadequate: TA techniques are required to provide the extra linguistic analysis. The most common approach to evaluation within text analytics is to compare machine output with human judgement. For example, part of speech taggers are normally evaluated by manually annotating a test corpus and then applying the tagger to the same data. Performance is then calculated by comparing the two sets of annotations. However, this process is often complicated by two factors: first, difficulties in obtaining consensus on the ‘correct’ manual annotation, and second, issues in determining exactly how annotations should be compared and scored. The first challenge is caused by the fact that people often disagree on the correct annotation for a particular fragment of text – for example, they may interpret the same sentence differently. Various steps are taken to maximise consensus between the annotators, but agreement is rarely unanimous and as a result the maximal level of human agreement represents something of a ceiling on the performance of any automated process measured using this technique. The second challenge is due to the complexity of analysis that is generated, since it can be difficult to determine how partial matches should be scored. For example, consider the sentence ‘Bill Gates is CEO of Microsoft’. If a NER system suggests ‘Gates’ is the name of a person (rather than ‘Bill Gates’) what credit, if any, should this, partially correct answer be assigned? Proposing ‘Gates’ as the name of a person, while not ideal, is certainly better than suggesting ‘Microsoft’ as a person. Once the systems have been scored, the performance is typically measured in terms of precision and recall, where precision is defined as the number of number of entities correctly tagged divided by the total number of entities tagged, and recall is defined as the number of entities correctly tagged divided by the total number of entities which should have been tagged. Attempts to maximize one measure will typically compromise the other (all other factors being equal), so in practice a suitable trade-off must be found. For this reason, these measures are rarely considered in isolation, and are instead usually combined into a single value, e.g. the F-measure (which is defined as the weighted harmonic mean of precision and recall). There are significant differences between the typical performances of TA techniques. Part of speech tagging and named entity recognition can typically be performed with >90% accuracy on business news, while accuracy for the information extraction from biomedical documents is typically below 70%. TA applications often combine together several component technologies, for example part of speech tagging and named entity recognition. There are often dependencies between these components; for example the named entity recogniser may rely on output from the part of speech tagger. Inaccurate output from one component can propagate through to subsequent processes that rely on them. However, it should be noted that measures such as precision and recall are fairly blunt instruments, and take no account of the user experience as a determinant of performance or success. For example, Elworthy et al. (2001) demonstrate the application of TA technology to the retrieval of captioned images, and in so doing also provide a novel method of results presentation and unique user experience that could not have been achieved without the use of text analytics. The value of such a capability cannot be expressed by measuring retrieval accuracy alone. In this post we have outlined some of the fundamental techniques in text analytics and explored the ways in which they can be applied to search and information retrieval. In an upcoming post, we’ll complement this with a look at text analytics applied to social media, in particular sentiment analysis and opinion mining. E. Brill, “Transformation based error driven parsing”, In Proceedings of the Third International Workshop on Parsing Technologies, Tilburg, The Netherlands, 1993.Church, K. (1998) A Stochastic Parts Program and Noun Phrase Tagger for Unrestricted Text. Proceedings of the 2nd Conference on Applied Natural Language Processing, Austin TX, pp 136–143. Cutting, D., Kupiec, J., Pedersen, J. and Sibum, P. (1992) A Practical Part-of-Speech Tagger. Proceedings of the 3rd Conference on Applied Natural Language Processing. Elworthy, D., Rose, T. G., Clare, A. and Kotcheff, A. (2001) A Natural Language System for the Retrieval of Captioned Images. Journal of Natural Language Engineering, Cambridge University Press, 2001. Green, B., Wolf, A., Chomsky, C. and Laughery, K. (1961) BASEBALL: An Automatic Question Answerer. Proceedings of the Western Joint Computer Conference, 19 219–224. Greenwood, M., Roberts, I. and Gaizauskas, R. (2002) The University of Sheffield TREC 2002 Q&A System Proceedings of the 11th Text Retrieval Conference. Grishman, R. and Sundheim, B. (1996) Message Understanding Conference – 6: A Brief History. Proceedings of the 16th International Conference on Computational Linguistics (COLING-96) Copenhagen, Denmark, pp 466–470. Harabagiu, S., Moldovan, D., Pasca, M. Surdeanu, M., Bunescu, R., Girju, R., Rus, V. and Morarescu, P. (2000) FALCON: Boosting Knowledge for Answer Engines. Proceedings of the 9th Text Retrieval Conference. Hirst, G. (1987) Semantic Interpretation and the Resolution of Ambiguity Cambridge University Press, Cambridge, England. Hovy, E. Gerber, L., Hermjakob, U., Junk, M. and Lin, C. (2000) Question Answering in Webclopedia. Proceedings of the 9th Text Retrieval Conference. Jing, H. and Tzoukermann, E. (1999) Information retrieval based on context distance and morphology. Proceedings of the 22nd Annual International ACM SIGIR Conference on Research and Development in Information Retrieval (SIGIR’99). Karlsson, F. (1990) Constraint Grammar as a Framework for Parsing English Running Text. Proceedings of the 13th International Conference on Computational Linguistics.Krovetz, R. (1997) Homonymy and Polysemy in Information Retrieval. Proceedings of the 35th Meeting of the Association for Computational Linguistics and the 8th Meeting of the European Chapter of the Association for Computational Linguistics (ACL/EACL-97). Krovetz, R. and Croft, B. (1992) Lexical ambiguity and information retrieval. ACM Transactions on Information Systems 10(2) 115–141. Marcus, M., Santorini, B. and Marcinkiewicz, M. (1993) Building a Large Annotated Corpus of English: The Penn Tree Bank. Computational Linguistics 19(2) 313–330. Ravichandran, D. and Hovy, E. (2002) Learning Surface Text Patterns for a Question Answering System. Proceedings of the 40th Annual Meeting of the Association for Computational Linguistics, pp 41–47. Sanderson, M. (1994) Word sense disambiguation and information retrieval. Proceedings of the 17th ACM SIGIR Conference. Schutze, H. and Pedersen, J. (1995) Information Retrieval Based on Word Senses. In Symposium on Document Analysis and Information Retrieval (SDAIR), Las Vegas, NV, pp 161–175. Scott, S. and Gaizauskas, R. (2000) University of Sheffield TREC-9 Q & A System. Proceedings of the 9th Text Retrieval Conference. Soubbotin, M. and Soubbotin, S. (2001) Patterns of Potential Answer Expressions as Clues to the Right Answers, Proceedings of the 10th Text Retrieval Conference. Voutilainen, A. (2003) Part of speech Tagging. In The Oxford Handbook of Computational Linguistics Mitkov, R. (ed.) pp 219–232 Oxford University Press. Wilks, Y. (1975) A Preferential, Pattern Seeking, Semantics for Natural Language Inference. Artificial Intelligence 6. Wilks, Y. and Stevenson, M. (1998) The Grammar of Sense: Using part-of-speech tags as a first step in semantic disambiguation. Natural Language Engineering 4(3). Woods, W. (1973) Progress in Natural Language Understanding – An Application to Lunar Geology. AFIPS Conference Proceedings, vol. 42, pp 441–450. Anaphora resolution: the process by references between separate expressions are identified and resolved. Artificial intelligence: the intelligence of machines and the branch of computer science which aims to create it. Categorization: the process by which ideas and objects are recognized, differentiated and understood. Classification: the process by which an electronic document is assigned to one or more predetermined categories, based on its contents. This contrasts with document categorization, in which the categories must typically be discovered as part of the process. Clustering: the assignment of a set of observations into subsets (called clusters) so that observations in the same cluster are similar in some sense. Derivational morphology: the process by which word meaning is changed through the application of derivations, e.g. the suffix “ee” changes the verb employ into the noun employee. F-measure: a measure of a test’s accuracy. It considers both precision and recall. Homonym: one of a group of words that share the same spelling and the same pronunciation but have different meanings. Hypernym: is a word or phrase whose semantic range subsumes that of a set of other words. Inflection: the process by which language expresses grammatical relations and relational categories such as tense, mood, voice, aspect, person, number, gender and case. Information Extraction: the process by which structured information is extracted from unstructured textual data. Lexical analysis: the process of converting a sequence of characters into a sequence of tokens. Morphology: the study of the structure and content of word forms. Named entity recognition: a subtask of information extraction that seeks to locate and classify atomic elements in text into predefined categories such as the names of persons, organizations, locations, etc. Natural language processing: a field of computer science and linguistics concerned with the interactions between computers and human (natural) languages. Phrase detection: the recognition of groups of words functioning as a single unit in the syntax of a sentence. Polysemy: the capacity for a word or phrase to have multiple meanings. Precision: the number of relevant documents retrieved by a search divided by the total number of documents retrieved by that search. Question answering: the task of automatically answering a question posed in natural language. Recall: the number of relevant documents retrieved by a search divided by the total number of existing relevant documents. Relation extraction: the process by which relations between named entities within a single sentence are identified. Relevance: the extent to which a topic of a search result matches the topic of the query or information need. Sentence boundary detection: the problem in natural language processing of determining where sentences begin and end. Sentiment analysis: the process by which the attitude of a speaker or a writer with respect to a given topic is identified. It is usually classified as positive, negative or neutral. Stemming: the process by which inflected (or derived) words are reduced to their root form. Summarisation: the ability to create an abstract or topical summary from a free text document. Text analytics: a set of linguistic, analytical and predictive techniques by which structure and meaning can be extracted from textual data. Similar to text mining, but with a broader focus on interactive applications and a greater emphasis on user experience. Text mining: the process by which meaning, structure and patterns can be derived from textual data. Wordnet: a lexical database for the English language. It groups English words into sets of synonyms, provides short, general definitions, and records the various semantic relations between these synonym sets. Word sense disambiguation: the process of identifying which sense of a word is used in any given sentence, when the word has a number of distinct senses. Here are the slides from the talk I gave at City University last week, as a guest lecture to their Information Science MSc students. 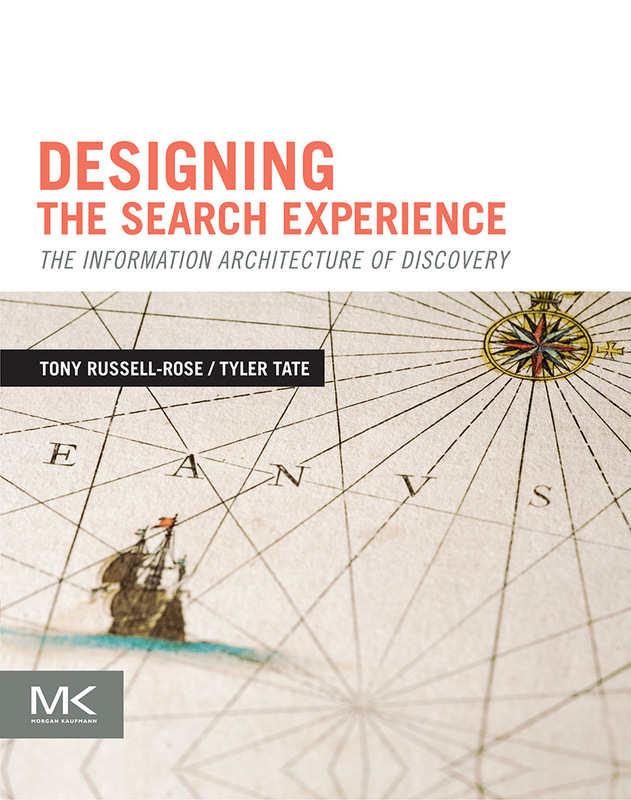 It’s based on the chapter of the same name which I co-authored with Mark Stevenson of Sheffield University and appears in the book called “Information Retrieval: Searching in the 21st Century“. The session was scheduled for 3 hours, and to my amazement, required all of that (thanks largely to an enthusiastic group who asked lots of questions). And no, I didn’t present 3 hours of Powerpoint – the material was punctuated with practical exercises and demos to illustrate the learning points and allow people to explore the key concepts for themselves. These exercises aren’t included in the Slideshare version, but I am happy to make them available to folks who want to enjoy the full experience. Better late than never … but here’s a quick report on the 3rd London Text Analytics meetup, which took place in early March at Fizzback’s offices on the Strand. I was particularly pleased to make this meeting a success as kick-starting the group was one of my resolutions for 2011… I’m convinced that there is significant potential for such a group in bringing together the nascent text analytics community in London. 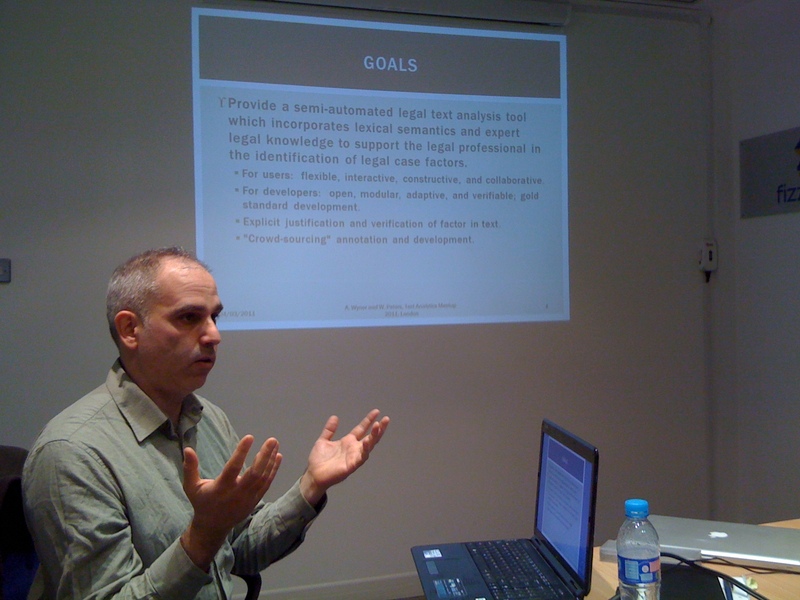 First up was Adam Wyner of Liverpool University, who described his work in applying text analytics to legal cases. Lawyers, it seems, are very text-oriented in their work, and much of their activity is based on the interpretation of legal precedent established through analysis of previous cases. This analysis takes the form of comparison based on a variety of legal factors, which are used in the argumentation and reasoning underpinning a given case. Clearly, if tools could be provided to reliably extract or identify such factors in natural language text, then the potential for facilitating the legal process (and providing tools for trainee lawyers) is considerable. Adam’s approach is based on a bottom-up process that identifies patterns of co-occurrence of specific legal concepts and terms, which are then mapped onto a taxonomy of 27 base-level factors. He’ll be talking more about this at the upcoming ICAIL workshop on Applying Human Language Technologies to the Law. He presented some quite plausible data showing how the themes of “sleep” and “sustainability” (as represented by their natural language descriptions in the product specifications and marketing material) had been extended to diverse products such as Tea and Laundry products. I know it sounds too good to be true – and no doubt my account has skipped over some of the key details – but I was encouraged to see that Adi had previously applied similar techniques at NASA and was able to present further data and a plausible rationale to back up his account. This is one application of text analytics I shall definitely watch with interest. So all in all, a productive evening, and good to see a full house. In fact, we’ll probably re-use the same formula going at future events: a research-oriented talk, a practitioner oriented talk, then drinks in a local pub. I’m already on the lookout for speakers for our next event, so if you’re amenable to having your arm twisted in such a way, drop me a line.